Provide a flat, level surface for the finish flooring. Provide a thermal break (i.e., insulation). Be able to dry out in the event of flooding. Not be too hard to install. Subfloors are not always necessary. They only come into play when you want to expand downward and make your basement a warm, livable space. Concrete or tile-over-concrete are acceptable floors for uninhabited basements. In order to install any kind of floor covering—engineered wood, laminate, carpeting—basement subflooring is required. Moisture: Even if you do not expect catastrophic events such as flooring, moisture can and probably will invade your basement. Since basements are nothing more than holes in the ground lined with concrete, and moisture is pervasive in the ground, moisture vapor will gradually work its way upward through concrete basement flooring and will condense. 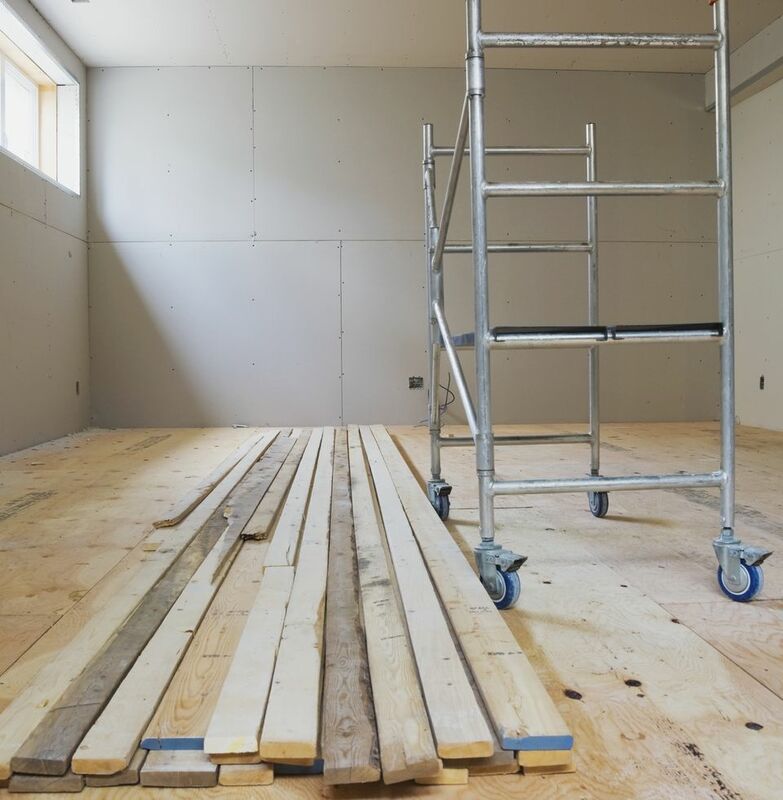 Height: Yes, you can build a 12-inch high basement subfloor and stay dry above everything, but basement ceilings tend to be low. Full 8-foot tall basement ceilings in older homes are rare, with 7-footers more the norm. Even an inch or two elevation in your subfloor will make a noticeable difference. This is the traditional method of building a basement subfloor. Height is the problem with this method, as it employs a system of 2x4 sleepers. Plywood fastened to the sleepers. 2x4 sleepers installed on center every 12-16 inches and fastened down, with rigid foam insulation 1 1/2" thick placed between the sleepers. As the least expensive subflooring option, floating plywood's only barrier between the concrete and the plywood is plastic sheeting. But it is thin and an easy subfloor to install. Rigid foam is a nice option because it provides an excellent thermal break between concrete and flooring. Plywood screwed down through the layer below. Rigid foam insulation—1 1/2" thick. Subfloor systems eliminate the "cake layer" approach and give you all layers fused into tiles that can be attached to each other--at a higher price than the methods above. Barricade is one such example: 2' x 2' x 1.125” tiles with OSB wood on top and closed cell polystyrene insulation, XPS on the bottom. The chief advantage of subfloor systems is the thinness of the product. Tyroc is another such brand. Coverage per panel is 5.3 square feet, with each panel measuring out at 48" x 16". Tyroc has the "thinnest profile of any other product in its category," per the company website. The list of materials is shown in the same order that you would visually see these materials in a cross-section. The vapor retarder is 10 or 15 mil sheeting of the type that you find at a Lowe's, Home Depot, or hardware stores. Plywood is 1/2 inch exterior grade kiln-dried plywood. Finish flooring is the top-most layer, the flooring that you will walk on.